The images below document the feedback the City’s Castro St. Improvement Project received from the community during 2013. 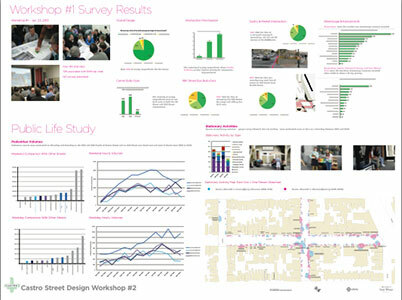 These images document the results from the first two community workshops held and also pedestrian count data from Castro St. that was collected at varying times over a week’s period. Input was also received via DPW’s Castro St. Design website. One goal of this community process was to try to determine what the priorities were for the neighborhood, acknowledging that not all of the initial ideas could be funded. If the bids came in high the City wanted input from the community on priorities. The top “extra” priority from this process was to make improvements at Jane Warner Plaza. The City was able to get this paid for in the bid. Decorative crosswalks also ranked high, but the City was not able to get these funded through the bid process. Because the community input process showed that decorative crosswalks ranked high on the list of improvements, the Castro CBD board of directors voted to pay for four (4) crosswalks. The vote was contingent on the community voting where they wanted the 4 crosswalks and voting on the design. The results of this survey and a live survey to be conducted on February 23rd from 1 – 4 p.m. in the Jane Warner Plaza (Castro & Market) will be used to determine which design will be chosen and the location of the decorative crosswalks. To receive up to date information about the Castro St. Improvement Project, including construction alerts, please go to http://castrostreet.org/index.php/construction-alerts and click on “subscribe to blog” in the right hand corner. Click thumbnails to open larger versions (pdf). These may take a minute to open. https://www.surveymonkey.com/s/CastroCrosswalkSurvey to let us know your preferences. Your participation is important. The results of this survey will be used to determine the crosswalk design and the location of the 4 crosswalks. The survey is closed.